If you’ve seen the way I play guitar (and other things with strings), you’ll know it’s a fair assumption for a stranger to make. But I’ve always had to say, “No…I’ve never even tried a lap steel.” Because that was the truth. I was always attracted to the sound of lap and pedal steel guitars — especially when used outside the context of country music, as an atmospheric thing — but lap steels don’t seem to show up in guitar shops too often, most of the new ones are vastly inferior to vintage steels in the mojo department, and the one time I saw a pedal steel in the flesh I was too intimidated to try it. There’s a whole science to playing those things that’s foreign to me. I played a little bit of slide guitar over the years when I felt a song called for it, but that was about it. While working on putting a supporting cast together for this solo-album-with-guests, I thought it might be worthwhile to try and get someone over here to play some pedal steel. I’m not sure there’s anyone in the area who plays. If there is, I’m not aware of them. I did find someone a few hours away who seemed willing to travel, but it didn’t pan out. I started to think if I couldn’t find a pedal steel session player, maybe picking up a funky old lap steel wouldn’t be such a bad idea. It would be an interesting new sound to play with, if nothing else. A few months back, when this was on my mind, I got a call from Mr. Chill. The last time he was here, he noticed my trumpet, asked to play it, and in a few seconds got some of the best sounds out of it anyone ever has. Turns out he used to play. I had no idea! He found my trumpet’s mouthpiece a lot more comfortable than the mouthpieces of some much more expensive horns. That got the wheels turning, and when the phone rang he was calling to ask how I’d feel about him borrowing the trumpet for a little while so he could mess around and see if he could get his chops back. I told him I just had to make a run to a pawn shop first to check out an old lap steel. “You need a lap steel?” he said. He went off to fire it up, I heard it make some noise in the background after being plugged into an amp, and he came back and suggested we borrow-swap — a trumpet for a lap steel. It sounded like a great plan to me, though I couldn’t stop laughing at the way it worked out. He came and gave me his lap steel, and I gave him my trumpet, and we’ve been making friends with each other’s instruments ever since. The steel doesn’t have a serial number, but through internet sleuthing and a little luck I was able to figure out what it is. It’s a Silvertone 1315, made by Harmony sometime in the early or mid 1950s. It’s got a Gibson P13 in it. That’s something of a forgotten pickup. When Gibson introduced the P90 they sold all their P13s to Harmony. Some people will rip the P13 out of an old lap steel and Frankenstein it onto an electric guitar. I can understand why. It’s got a really unique, round, warm sound to it. It might be too dark for some people in some applications, but through a Fender Twin the thing sings. I still need to try it through that little old Mason Model 5 (which was made to amplify a lap steel, after all). I’m not going to pretend I became a virtuoso lap steel player overnight, but after a day or two I felt like I got the hang of it pretty well, and I’ve been comfortable playing it ever since. It probably helped that I was already used to playing guitar on my lap. It’s become an important new sonic weapon, and that lap steel has now shown up somewhere on almost everything I’ve been recording — even music that isn’t mine. I’ve stuck it in a bit of a weird tuning that allows access to major and minor chord shapes without the need for bar slants, and I tend to drench it in delay and reverb, because I like that ambient, ghostly sound. 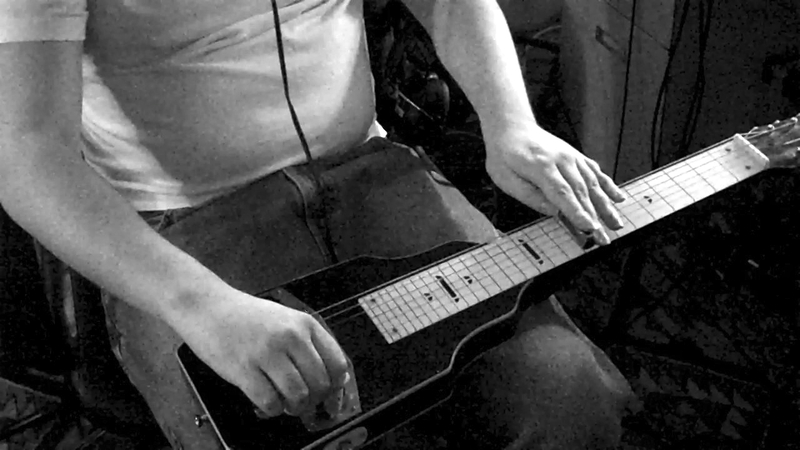 Sometimes backwards lap steel is just the ticket, too. As for Kelly, I think he’s been having as much fun with my trumpet as I’ve been having with his lap steel. He’s used it at some shows with the Walkervilles, and he even laid down a trumpet part for a Big Sugar song, though it didn’t end up making the final mix. I don’t think either one of us is in a hurry to swap back, and that’s fine by me. I don’t think this lap steel had been given any love in quite a while, and I’ve always got the bugle as my backup horn for those times when drunken elephant sounds are needed.